Has it really been more than 30 years since Ghostbusters took the world by storm? Yup – 2014 marked the film’s 30th anniversary, yet another milestone that made me feel old! Because I’ve already reviewed the film four times since its 1999 DVD debut, I’ll omit my usual blather. If you want to check out my complete thoughts about the movie, just click the link above. Ghostbusters appears in an aspect ratio of approximately 2.40:1 on this Blu-ray Disc. Expect a strong visual presentation here. Sharpness satisfied. A few wide shots seemed a smidgen soft, but those were a minor distraction, as the majority of the movie exhibited good to great delineation. No issues with shimmering or jaggies materialized, and edge haloes remained absent. I noticed no print flaws, and the image showed light but consistent grain. Colors were fine. The film didn’t boast a broad palette, as it preferred a tone that emphasized an “industrial gray” feel. Some brighter hues popped up on occasion, though, and the colors remained appropriate. Blacks were dark and tight, and shadows showed nice delineation. This became a satisfying rendition of the movie. The DTS-HD MA 5.1 soundtrack of Ghostbusters worked well. Ghostbusters didn’t use a tremendously broad soundfield, but it opened things up more than usual for a flick of its era. Music showed nice stereo dimensionality, while effects spread smoothly across the front. As one might expect, the various ghost-related scenes offered the best opportunities for movement and activity, so the soundtrack provided the most action in its second half. The surrounds added good life during those spook segments. They kicked in good reinforcement of the spirits and Ghostbuster attacks, so they became reasonably active partners in the action. Audio quality held up well over the last 31 years. Only a smidgen of edginess ever interfered with the lines, as they usually seemed clear and concise. Music showed good range and vivacity, and effects appeared well-rendered. The various elements showed nice definition and offered a good punch in the louder moments. Distortion wasn’t a problem, as only a little crackling ever crept through into the mix. This was a well above average track for a mid-80s flick. How did this 2014 Blu-ray compare to the 2013 4K Blu-ray release of Ghostbusters? Audio was a wash. The 2014 disc used a DTS-HD MA track instead of the prior release’s Dolby TrueHD, but I couldn’t discern a difference between them. In addition, the two discs looked virtually identical to me. They came from the same 4K transfer and seemed to be a whole lot alike. Whereas the 4K Blu-ray omitted all extras, the 2014 Special Collector’s Edition comes with plenty of bonus materials. We begin with the same audio commentary found on the DVD and original Blu-ray. It includes a running, screen-specific chat with director Ivan Reitman, co-writer/actor Harold Ramis and associate producer Joe Medjuck. They discuss the project’s origins and the development of the script, improvisation and characters, casting, visual effects, sets and locations, and general anecdotes. At its best, this track offers a nice take on the film, and I certainly can’t fault the scope of the material. However, too much of the time, we simply hear quotes of movie lines, praise for the flick, and laughing at the gags. Occasional dead air also mars the proceedings. There’s definitely enough good information on display to make this a useful commentary, but the flaws mean that it doesn’t ever become a great one. An interactive Slimer Mode gives us information throughout the movie. It uses pop-up windows to provide some text facts as well as interviews with various folks involved in the production. We find notes from Reitman, Ramis, Medjuck, writer/actor Dan Aykroyd, film historian Paul M. Sammon, animation supervisor/creature design consultant Terry Windell, visual effects supervisor Richard Edlund, visual effects art director John Bruno, associate producer Michael C. Gross, creature design consultant Bernie Wrightson, and actors Sigourney Weaver, Ernie Hudson, and William Atherton. The comments cover the original story treatment and its evolution into the final script, cast, characters and performances, the production timeline and related pressures, creatures and effects, science and influences, sets and locations, the Ecto-1 and other props, the theme song and score, and a few other production topics. We get a pretty good array of information from the “Slimer Mode”. The text boxes are the most inconsistent side of things. Many of these – especially the ones about characters – just repeat information we get during the film itself. They do occasionally offer some fun “facts” about various locations, though. As for the interviews, they tend to be useful. They pop up less frequently than I’d like, especially during the film’s second half, but they come around often enough to avoid frustrations. “Slimer Mode” isn’t the best of the interactive Blu-ray pieces I’ve seen, but it’s engaging enough. For more about the film’s iconic automobile, we go to Ecto-1: Resurrecting the Classic Car. In this 15-minute and 37-second piece, we hear from Aykroyd, Ramis, Sony Pictures Consumer Products director Keith Hargrove, Cinema Vehicle Services owner Ray Claridge, Cinema Vehicle Services mechanic Mark Mazure, and Cinema Vehicle Services shop manager Sam Salerno. We get a few notes about the Ecto-1 and its modern refurbishment. The show offers a moderately interesting look at the work put into bringing the car back to life. A running photo montage comes to us with the five-minute, 27-second Ghostbusters Garage: Ecto-1 Gallery. This shows the state of the vehicle pre-restoration and as it went through refurbishment. It’s mildly interesting at best. As implied by its title, the 1984 Featurette was produced at the time of the movie’s theatrical release and runs nine minutes, 45 seconds. It's essentially a puff piece but it's a lot of fun. Due to lots of good footage from the set, it offers more depth than the usual promotional featurette, and the brief interview clips with the principals are very entertaining. We hear from Reitman, Weaver, Aykroyd, Edlund, production designer John De Cuir, and actors Bill Murray and Rick Moranis. Murray proves especially amusing as he tosses out his usual wisecracks. We don’t learn tons about the movie, but we enjoy the ride anyway. We also get a 1999 Cast and Crew Featurette that goes for 10 minutes, 53 seconds. This one only includes interviews with Ramis, Reitman, and Aykroyd. We hear about the project’s origins and the recruitment of the team members, story issues, their kids’ reactions to the movie, impressions from the set, and the flick’s impact on their careers. It's got a few decent moments but it’s not as much fun as the 1984 one. Murray, Weaver, and Moranis are sorely missed, and it lacks all the interesting behind the scenes shots. I also would have liked more about making the flick and less of Aykroyd’s unconventional ideas about the supernatural. Finally, a third SFX Team Featurette provides 1999 interviews with much of the special effects crew; it lasts 15 minutes and 22 seconds and includes remarks from Edlund, Bruno, Windell, technical animator Annick Therrien, visual effects editor Conrad Buff, chief matte artist Matthew Yuricich, model shop supervisor Mark Stetson, chief visual effects cameraman Bill Neil, matte department supervisor Neil Krepela, mechanical effects supervisor Thaine Morris, visual effects still photographer Virgil Mirano, and matte artist Michelle Moen. We learn how the team came together, various challenges – including the budget – and how they accomplished the flick’s main effects and visual elements. It’s entertaining, partly because of the "old school" methods that were used – I can't watch "Slimer" fly around the chandelier without laughing now that I know how they did it - but also because the participants don't just focus on the technical work. They also provide insight into the other aspects of the production. Although I wish it were longer, it's a fine featurette. A section called Multi-Angle Explorations that lets you view shots with or without effects. You can examine the way they looked in the finished film and they way they appeared in the rough cut before the special effects were added. The six-minute, 13-second collection includes three sequences and uses the “angle” feature to flip between them. It offers some decent material but nothing special. We also get storyboard comparison for three different scenes; the storyboards appear on the top of the picture while the actual film images appear on the bottom. We get these for “Slimer” (2:13), “Dogs Drag Dana” (2:09) and “Atop Spook Central” (2:04). These are okay, but never terribly fascinating. Ghostbusters features ten deleted sequences in the Scene Cemetery. The shortest segment is 18 seconds long, whereas the lengthiest goes for one minute, 25 seconds; in total, we get seven minutes, 52 seconds of footage. None of these are fantastic - you can see why they weren't used - but they all are fun. The best of the bunch provides a bit that features Murray and Aykroyd in different roles. We also find a compilation of Alternate TV Version Takes. This reel runs one minute, 31 seconds and presents six scenes devoid of their original profanity. In each case, the changes neuter the sequences, but they’re still cool to see. In addition to the film’s trailer, we find a music video for Ray Parker Jr.’s hit “Ghostbusters”. The latter mixes movie snippets and some unique elements, including a bunch of cameos and even some “new” footage from the Ghostbusters themselves. It’s not really very good, but those of us old enough to remember when it was new will enjoy it. Made for this 2014 Blu-ray, Who You Gonna Call: A Ghostbusters Retrospective lasts 24 minutes, one second. Hosted by entertainment journalist Geoff Boucher, we find notes from Reitman and Aykroyd. They talk about aspects of the film’s development and creation as well as reflections about its ongoing legacy. Some of the info repeats from prior features, but we still get a likable chat here. Finally, Gallery 1988 Ghostbusters 30th Anniversary Print Collection gives us a still gallery. It provides 30 pieces of art created to represent the film. Actually, some of the stills just show variations on the same image, so we don’t find 30 unique elements. Nonetheless, they’re interesting and cool to see. Inside the packaging, we find a digibook. This 28-page piece offers photos, art, essays called “The Story of Ghostbusters” and “The Story of Ghostbusters II” and 1984 bios for Reitman and the main cast. The book adds value to the set – as does a card with “A Personal Note from Ivan Reitman”. After more than 30 years, Ghostbusters remains a comedy classic. I’ve seen this movie at least 30 times over that span. And you know what? It still makes me laugh. The Blu-ray offers very good picture and sound with a strong roster of extras. 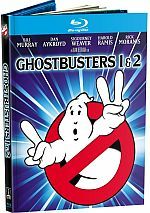 This 2014 Blu-ray becomes the best version of Ghostbusters on the market. Note that this version of Ghostbusters is available only as part of a “Ghostbusters Special Collector’s Edition”. This set includes the original Ghostbusters along with its 1989 sequel. It sells for the bargain price of about $27 list, which makes it a nice deal if you don’t already own the first film on Blu-ray – or if you want to upgrade from a prior version.